It’s never been easier to make your titles available all over the world. 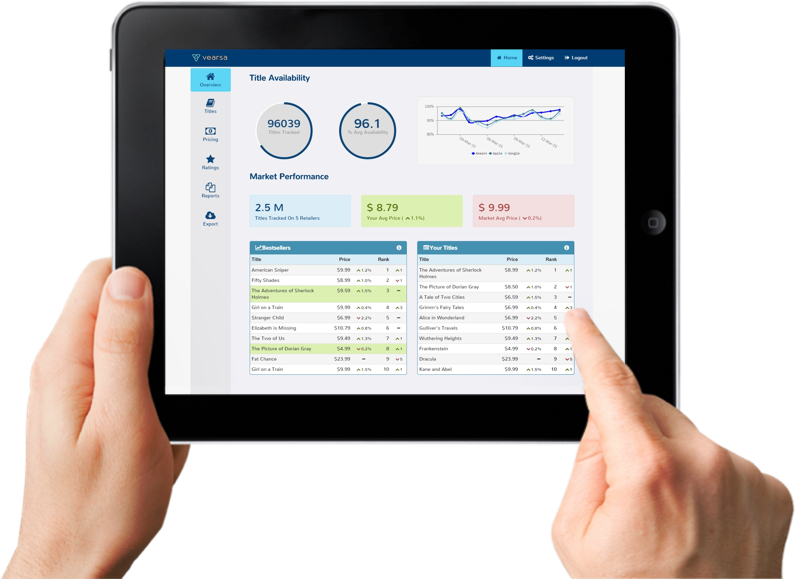 Manage all your digital sales reports and business models in one consolidated analytics platform. access detailed sales analysis, future trending, and daily sales for key insights. No more spreadsheets, not more manual file pushing. You’ll save up to (#) hours every week. Increase your revenue at least 15%. Increase visibility and exposure for your titles and reduce your dependence on market leaders. Drill down into 60+ standard sales reports. Understand the who, what, where, why and when - and use that information to grow your business. Dramatically increase your sales for the price of a daily latte. The Vearsa Distribution platform is flexible, intuitive, and built from the ground up specifically for eBooks in collaboration with hundreds of publishers. You’ll save up to 40% on your current eBook management workload—and have personal access to our world-class support team and a robust online helpdesk. Vearsa Analytics allows you to view sales data for your entire catalogue on a single screen. Track a title’s performance month-on-month, identifying movers and the impact of sales and marketing on revenue. - How are you titles performing in Europe? One click. - How did Kobo do with that latest new release? One click. - How is the retailer mix changing over time? One click. Drill down through your data to find the details that really matter. Drive your eBook business through actionable insights and do away with guesswork. - By Country: Spot growing markets and trends across retailers. - By Title: Know your star performers. Reinvigorate your backlist. - By Category: Identify high potential niches and strategically build your list. Wonder no more. 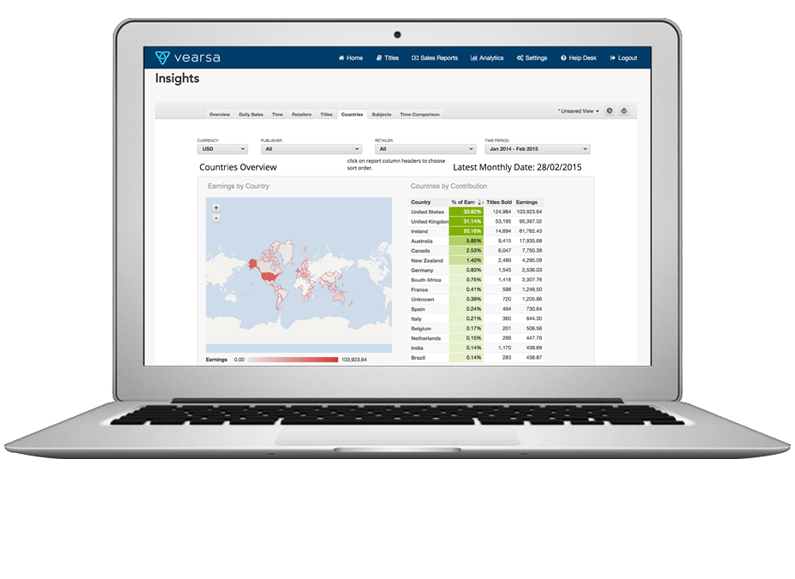 With Vearsa Anaytics you can understand the impact of your sales and marketing decisions within days, not months. Your Vearsa account provides you with a secure data warehouse for your titles. We use the latest technology to keep your copyrighted material safe and sound. Each retailer or library is carefully vetted from a security standpoint and your files are stored and transmitted above the latest encryption standards. Manage all your eBooks in one place. Access your data anywhere, anytime. Vearsa is trusted by hundreds of publishers all over the world. We're proud to partner with publishers all over the world - we are as vested in their success as they are.